Well folks, you certainly delivered when I asked for uses for my glut of butternut squash. I hope I don't a)disappoint anyone with the things I decided to make, and b)bore you to tears with squash post after squash post after squash post. You must realize by now that I'm a fan of the muffin. Unsurprisingly, my first thought (seconded by several of you) was to muffinize the squash. After doing some searching, I found two equally-tempting recipes and obviously, I was forced to try them both and have a muffin match of sorts. This first recipe appealed to me primarily because of the gorgeous crumb topping (originally sans cinnamon, but of course I fixed that). Take a gander for yourself. While the cream cheese innards sounded good, I had none on hand and couldn't justify a trip to the grocery store for cheese alone. Regardless of the lack of filling, this is a stellar muffin. Although the slightly crunchy crumb topping was indeed glorious, the real kicker for me was the cloves. Yes, they overpowered the cinnamon (which hurt my feelings for a hot second), but their aroma is just so soothing, blissful, and sigh-inducing that I quickly forgot. Because this was the superior muffin recipe in my battle of the butternut, I'm submitting it to Jeanne of Cook Sister! for the 20th installment of the Waiter, There's Something in My... event. Luckily for me, the theme this month is gourds, so these will fit right in. Preheat oven to 350 degrees. Spray, grease, or line your muffin tin. To make the crumb topping, combine the flour, brown sugar, cinnamon, baking powder, and salt in a bowl. Stir in the melted butter, then pinch the mixture (go on, get in there with your fingers!) until pea-size clumps are formed. Set aside. 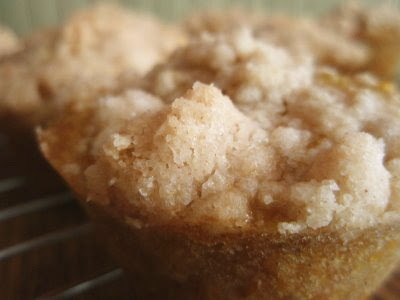 For the muffins, mix together the flour, cloves, cinnamon, baking soda, and salt in a small bowl. In a larger bowl, combine the eggs, oil, squash, sugar, and vanilla. Add the flour mixture and stir until just combined. Fill the muffin tins 3/4 full. Sprinkle each cup generously with topping. Bake for 20-25 minutes, until a toothpick comes out clean from the muffin. Let cool in pans for 5 minutes, then remove to racks to cool completely. Makes 12 muffins and two mini loaves. Guess what? There's a big ol' surprise for you over at my blog this morning! Thanks for your patience. Excellent idea on the muffinizing of your squash family. I'm in love and will have to make these. No question. I can just smell their heavenliness. Is that a word? I still have 2 butternut squash sitting on the counter..........this sounds like an idea!!! Never had butternut in my muffins. But I am sure I would be in heaven! Oh yeah, we are having a butternut squash high at the moment, but these are wonderful recipes! Those muffins look so moist. Not fair to tempt us with such lovely pics. Oh muffins. But hey, top anything with streusel and I'm bound to eat it. I also have a confession. I'll use just about any excuse to go to the grocery store. Keep those buckets a coming!! Looks just fabulous, loving it!! I bet those are fablous just fresh out of the oven and a cold Fall morning. mmm. You can keep posting squash recipes all day long and I won't complain. I keep buying the little buggers and staring at them going ok now what. I'm looking forward to all of the butternut squash posts myself. In a muffin? Never thunk it! I can only imagine the beautiful aroma coming from your kitchen when you baked these. Lovely! Delicious looking crumb topping. Can't wait to see muffin match part deux! You are so creative. I would have just shoved them on the grill. Squash muffins! So cute. I love muffins, too. Butternut muffins or bread make sense, since you can use butternut squash just like pumpkin according to my mother in law. Your love of cinnamon is like my love of crumb toppings. I need one of these NOW!! These look wonderful Grace! My dad always grew tons of butternut squash-we'd have a marathon peeling, steaming, mashing and freezing squash day late in the fall. Our hands used to be orange and stiff from all that peeling but BOY did it taste good all during the year! mmmm... i can smell those through the computer screen. mmm...cloves for me is a very close second to my dear love of cinnamon. Those look scrumptious! I've never made a muffin with butternut squash but this post just might change my mind! What a creative idea. The recipe sounds really good and the muffins look fantastic! Oh that's awesome, I love this idea...gosh anything can become a muffin. I really want these for breakfast. I have cooked butternut squash too. I made the butternut squash with lasagna from proud Italian cook this week, then later made for appetizers a Brie, caramelized onion, green chile, butternut squash quesadilla. YUM! Now I want that muffin. I've been hacking my b squashes in half and putting them in the crock pot for a few hours on high. Easy peasy. Wish I had buckets of butternut too. I think I suddenly like butternut reading this! Love the brown sugar crumb topping. Yummy fall food! I can already imagine how good this would smell and taste with those flavours! Wow a tsp. of cloves! No wonder they over powered your cinnamon. These sound so good, I am a fan of cloves and with some spiced cider these would be great! Ah cinnamon, I love it too :). Thanks for posting this, I always find myself buying butternuts and running out of ideas for what to do with them :). Butternut Squash muffins?? I love it! Quite honestly is there anything that can't be muffinized? What could be easier to eat and more fun to make than a muffin (or vice versa)? Love this idea... especially since I plan on buying a whole BAG of butternut squash at the farmer's market this weekend for storing/eating. Squash post never get boring! 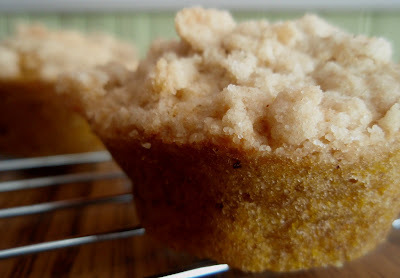 I like the sound of these squash muffins with crumbs! I am so happy to know you made a squash muffin! I was telling my better half just last weekend that butternut squash would make a good muffin and he went "Meh." Imagine that. These look delicious Grace! The muffins look killer... who would have ever thought to make muffins out of squash? I bet they are rich in taste and very moist. These sound great--I love cloves. I must have been having a savory moment when you asked that question bc I wasn't even thinking about baked goods. I have a great Butternut Squash Oatmeal (yeast) Bread recipe also that is wonderful. These are nothing short of amazing! They sound delightful! I love butternut squash. Good idea. I can see a new favourite sneaking up on the cinnamon ;). The muffins look so moist, love them! Ooooh...muffiny squashes! Sounds delicious--especially with the crumb topping. Yumyumyumyumyum! 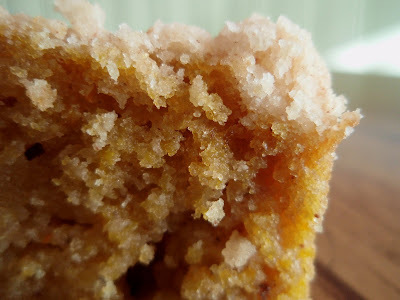 Super-moist looking and I love cloves & spices, make it all nice! Yum, that sounds so perfectly fall! I like the "muffinizing of the squash" - it sounds like a good mystery. Those look awesome even without the cream cheese filling. I am just so envious of your ability a recipe to what you want or have on hand! Okay, I really should re-read before I publish my comments, DUH! Yummy! Love crumb toppings on muffins/breads. I've never had butternut muffins, but I love the sound of it. And from the photos, I love the sight of it, too! Yes, I could absolutely eat the pumpkin butter with a spoon! Whipped cream on top is perfect too, like a crustless pumpkin pie! Hmmm, I wonder what butternut butter would taste like!?!? You're a genius, I never would have thought of muffins, I was thinking more savory than sweet...for once! LOL! i'm glad you decided to muffinize. these look delish! I love love love these woman!!!! Awesome! i love anything w/a streusel or crumb topping!!!! What a fantastic creation, I love this combination of flavors! These are so cute, Grace! I'm so glad you made muffins. I'm a muffin girl, as well. Also everything with cinnamo & cloves is so good. You are never boring! These look so good! I'm thinking more and more about how squash and pumpkin recipes can be combined or switched. This sounds so good, and looks even better! YUM! Butternut squash is one of my favorite vegetables. I am going to roast some and serve it on a bed of greens with toasted walnuts. I could eat butternut squash plain with salt and pepper it is so good. Ahhhh, now I see. Yes, yes, this one does sound like a winner. I was sold on the muffin when I read "crumb topping"!! Yummy stuff!! But you will make a batch with the cream cheese sometime, won't you? These look superb! Perfect texture. Crumb topping?? Cloves?? Sounds totally irresistible. I have a butternut sitting on my kitchen counter and now it may well end up in a muffin! Wow - these look delightful. Such a delicate crumb! This is a must-try. Beautiful, beautiful photos. I can practically smell them from here! I was searching for a good squash disguise for dinner/dessert tonight and ran across this one. I just tried this recipe. DELICIOUS!!!! And so easy. I doubled the recipe and realized I was short a muffin tin...so I baked it all in a greased and sugared 9x13 cake pan. It did have to cook longer...Oh so good! Even my daughter who "doesn't eat squash" ate it and liked it. Thanks for the recipe. How many people actually tried this recipe before commenting? my guess? one, october 9th. what's your point? YUM! These came out great :) I only did half the recipe because I had 1/2 cup puree leftover from a recipe I did before. It came out really moist and soft. My only qualm was the crumb topping, perhaps when I halved it I didnt add enough butter or sugar because it came out sandy. Very easy recipe too!! Thanks!